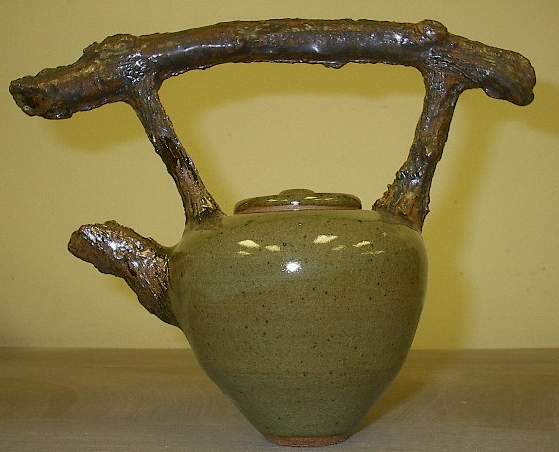 Teapots... well, I had never made a single teapot until this past semester at school (fall 2001). One of my assignments in my ceramics 4 class was to cast an object and use it on a piece / several pieces. I got the idea to cast a stick while walking up to class one morning. The project almost seemed to make itself from that point on; I cast about three other sticks, and used the molds to make spouts and handles. I had other teapots of different sizes and one mug, but I sold most of them at the craft sale and to friends outside of the sale. 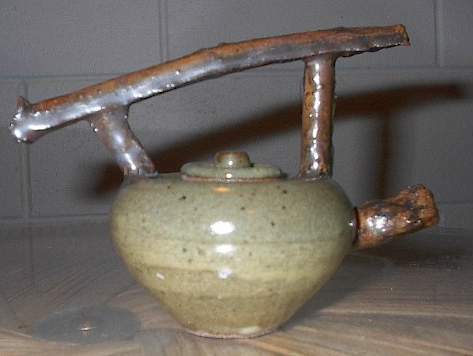 This teapot set was the only one I made with the stick handles this color. I painted a temmoku glaze on the sticks, and used a Celadon green glaze for the body. This teapot was only about the size of a small apple; I painted a VC Yellow Red glaze on the stick handles and used Celadon for the body. I used the Yellow Red glaze for every other teapot, because I found when I painted it on in layers it often came out of the kiln looking like real wood looks. This piece (although a bad picture! 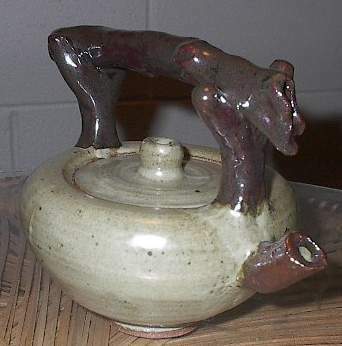 )used the Georgia Green Black glaze, was fired in a hot part of the kiln; making the body come out an unexpected red color (seen on the other ceramics page on my one piece). This was the largest, tallest teapot I made. It stood about 15" tall. At this point I began to carve into the sticks to make them appear more realistic, and at the same time it allowed the VC Yellow Red glaze to settle into the carvings more. 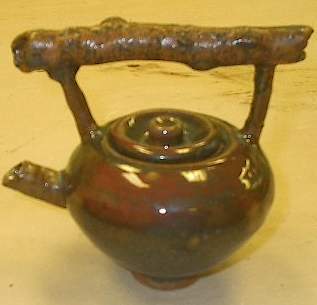 For this teapot I used Georgia Green Black on the body; the top of this piece can actually be used as a candle holder. A candle fits inside of it. 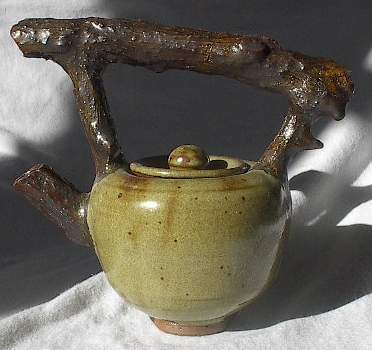 There is a short story with this teapot; I used Celadon for the body, and this piece came out from the kiln looking great. I happened to break the handle off when excitedly taking it out of the kiln. 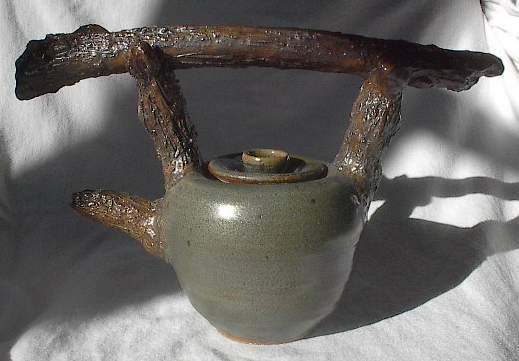 I reattached the handle, and refired the teapot... the end result was that the celadon ended up somewhat crackling, making the body somewhat represent how a leaf looks. 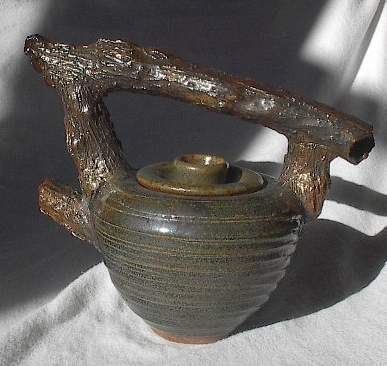 Another teapot using Georgia Green Black; the top for this teapot is another candle holder.